00.05 – Wendy: Meccano [several people repeat Meccano]. Keith: It took me a long time to talk my parents into buying me some because the said that I’d never cope with it. And I think that getting some, they were quite right. It was quite tough to build things. And I could never quite be bothered to take them apart again. Wendy: You’d have a little screwdriver wouldn’t you? Raymond: Yes, yes, that’s right. Raymond: I was just going to say – we always used to make a crane. Andrea: And yes it works. You can turn the handle. It should work. Ann: I used to like making those ones. Wendy: It goes up and down doesn’t it, with string. Keith: Yes that’s a bit more sophisticated. I haven’t seen that. With ropes and gears and pulleys and things. This is a posh one. This is a silver one. Ours was green and red. Andrea: That’s a newer one. We have got some green and red Meccano and I nearly brought it with me but it’s all in bits so we thought we’d bring an actual model. So that’s slightly more modern, that one. Keith: Yes, ‘cos you got different boxes, different kits. I did manage to get a set of gear wheels once. I got a box of different gear wheels. All different sorts of wheels, pulleys. Chains and all that. I did play quite a lot with that. Raymond: ‘course it was occupying you, making you, making you ready for when you grew up and went to work wasn’t it? You were making things, that was it. Ann: You’ve got a spring there haven’t you? Wendy: And you had to work it all out and get the right pieces. Ann: You’ve got cable through there, look. Keith: I expect that’s probably why some older folks can cope with things Ikea sells. They used to come with books of instructions about how to assemble these things. Lizzi: Did you read the instructions? Keith: Oh yes (Lizzi: followed it). Read the instructions. That’s it, that’s the thing I’m making. Keith: Yes, I can remember that. Clare: ‘cos is Meccano still made now? (Andrea: Yes) and they do plastic versions and technic versions and cogs and all sorts of gears and it’s got really complicated. Keith: Oh I made that one. Yes, I definitely remember making that one. Keith: That one [points at catalogue]. I particularly liked making those. That was good. Ann: Well you’ve got the … what do you call it? Andrea: We’ll come to that in a minute. Ann: There was a shop down Sackville Road, under the bridge. Wendy: Is that gone from West Street? Lizzi: Yes, the model shop. Wendy: I used to go down there to get planes. Balsa wood. Clare: I used Lego. Was Lego around in this era? Clare: ‘Cos is it relatively modern? Wendy: We didn’t have plastic. Keith: [looking at Meccano catalogue] Treasured possession in those days. You were really upmarket if you got one of the motors. Andrea: Really upmarket if you got which one? Keith: One of the motors, the Meccano motors. Raymond: Oh yeah, yeah, yeah. Keith: I mean that was expensive. Lizzi: When you say expensive, do you remember how much roughly they were? Keith: Probably two and sixpence or something like that. I expect a very rough guess at five or ten shillings or something like that. Lizzi: Which was a lot, wasn’t it? . Keith: I’m Keith and I was born in Brighton in 1937. Raymond: And I’m Raymond and I was born in Brighton in1932. Wendy: And I’m Wendy and I was born in Crapstone [laughing] in Devon in 1941. Ann: And I’m Ann and I was born in Shoreham in 1939. 00.39 – Andrea: Thank you very much. So, before I show you any of our bears, does anyone remember having a teddy bear when they were young? Wendy: Yes I did, I had a teddy bear, it was only about so big and he was two different colours and he was called Honey, my honey bear and I was very fond of him and I don’t know what happened to him. Andrea: Do you know where he came from? Wendy: I think he may … I don’t know … I think he may have come from Egypt because my father was in Egypt during the war, that’s how come we were down in Devon and he was in Egypt and he sent me a couple of things and I think the teddy bear possibly came from him. I can’t remember. Andrea: And did you play with the bear? Wendy: Um, I must have done, yes and took it to bed I suppose, like children do. I presume I did, yes. And I’m very sad because I don’t know when it went. And I also had a [laughing] when my father came home from Egypt, it must have been my fifth of sixth birthday, I had a squirrel and my father had put it on wheels with a string and I used to pull it along. And what I didn’t know was he bought the squirrel from a second hand shop and it was a real squirrel, been stuffed up, what do you call it? Andrea: Did it change the way you felt about it when you found out? Wendy: No, I was much, much older. I was probably 16,17 before I was told. Maybe even older than that, I don’t know. Lizzi: Did Squirrel have a name or? Wendy: I can’t remember it having a name, no. Lizzi: It was just squirrel. 03.25 – Wendy: But I did love that squirrel. I used to pull it around on a bit of string ‘cos in the war, or just after the war, things I mean you might know but you wouldn’t, toys were very hard to come by and I had an aunty that had a doll sent to me from Germany and it was black. [laughter] A black doll, yes and that was china. Iona, I called her and I don’t know what happened to that either, unfortunately. And golliwog of course. I think most children had but I don’t think they’re allowed now, are they? Lizzi: Did anybody else have a teddy bear? Ann: I had a Rupert book. He’s a teddy. Keith: Oh Yes, I had a Rupert teddy. He used to change colour over the years ‘cos my mother used to knit him a fresh coat or fresh skin. And I remember particularly as being quite a dark brown and then I had another one to go with him. I had no idea where they came from of course and that one was just warm, teddy colour and that one was little Ted and I had Big Ted and Little Ted. It never worked, ‘cos he was too heavy but Little Ted did a bit better than Big Ted. What happened to them afterwards, I have absolutely no idea. I think my mother disposed of most of my toys when I grew out of them. Andrea: So were they knitted, these bears? Keith: The bears were whatever you make bears out of – fur and all the rest of it. But that obviously wore and the sort of second skin that was put on the top was definitely knitted, because one of the things my mother could do of course was knit, she knitted different kinds of things and Big Ted, Rupert, they got a new coat every so often. Andrea: Anyone else about bears? Raymond: I’ve got a lot of bears now. My wife used to have them. I mean we’ve got one big one that sits on the side. We’ve got a polar bear on that end of the bed, bedroom and there’s a honey bear. A honey bear, yes and also there’s another bear … I don’t know what that one is. You know, they’re sitting along the back of the bed you know, but you know. But the big bear was, you know, when I lost my wife, that bear was a big comfort to me to be quite honest with you. It’d usually go to bed with me at night, you know? This is the thing. And you know, it was a big comfort to me, that bear, yeah. We’d had them for years. I mean they were my children’s bears originally, that’s it, yeah, but yeah, that’s my experience of bears. Lizzi: Did they have names? Did you name them? Raymond: No, well the big one, we called Big Ed, that’s it, Big Ed [laughing]. Andrea: Did you want to say something about bears? You look like you do. 07.45 – Clare: Well I had a big bear as well and yeah, my auntie and uncle gave my parents a big bear before I was born, so there’s the whole joke that he’s older than me ‘cos he was sitting waiting in my cot, when I was born. And it was one of those old fashioned, not those soft kind of bears, with the proper jointed arms and legs, where there’s cotton strung through so they actually move so it’s kind of with stitching up the back and the front and then it had something inside so if you tipped it over it would make a grrrah growling sound and there’s loads of photos of me, cause I was quite small when I was born, so I was probably like that big, with this big bear that was about twice the size. And I’ve still got big bear, it’s a bit dusty now. And my children actually got given big bears by the same aunty and uncle actually. So that’s quite interesting and they love their big bears too so it’s kind of [phone rings] a bit of a family tradition. Andrea: Did you play with him? Clare: I dressed the bear up. I did doctors and nurses, I did bandages, I did nappies and dresses and in a cot and in a little buggy, pushing a little buggy along, the whole works. Andrea: I always think that’s interesting with bears … some people play with them but a lot of people with bears, they’re just there and they sleep with them and they’re a comfort and they’re something to cuddle but they didn’t really play with them so I think it’s always interesting to know. 09:25 – Do you want to see the ones we’ve brought along? We have a selection of bears. [There is some general indistinct talk for a while as people look at the bears]. 10.50 – Andrea: Yeah, that one there in the pyjamas is called Gustav. Yes, he’s about 100 years old, Gustav. Wendy: He’s 100 is he? Raymond: And where did he come from? Germany? Raymond: ‘Cos they were the bears. Years ago. The Germans, yeah. Andrea: They were. I think 1920s, so he’s not quite 100. And I think he used to have a growler. Not working anymore. Raymond: The growlers. When you tipped them up. Clare: Is that what they’re called? Growlers? Andrea: I nearly brought one along, but the one we’ve got sounds more like a sheep. Clare: Mine sounded like a sheep. It was a bit of a ‘mnyeeeeeeeeee’. This one looks very old too. Wendy: This one’s pretty old too isn’t it? Andrea: Yeah, but it’s handmade. He’s made by someone’s mother. Which is why if you look his eyes are lopsided. 12.22 – Wendy: Have you had that one? Wendy: Sooty and Sweep wasn’t it? Raymond: That’s right. Sooty and Sweep. Wendy: [playing with Sooty puppet] “I quite like being here. Hello. Hello everybody.” Oh it’s lovely isn’t he? He’s Sooty. Isn’t he sweet? Do you want them back? Andrea: You can pop them on the table. If they’d like to be in the video. Wendy: Sooty was that colour wasn’t he? Raymond: He was white and black wasn’t he, Sooty? Because he was a panda, not a bear. Wendy: Who was a panda? Wendy: Susie was a panda. I think Sooty was a bear. Just like that. ‘Cos he’s got ’Sooty’ there [pointing at label]. I know my son used to watch Sooty. Sooty and Sweep. Andrea: That is a hippo. What’s quite interesting is when we’ve been saying to people ‘did you have a teddy bear?’ they’ve been saying things like ‘yes, I had a lion’ or ‘yes, I had a hippo’, as if teddy bear is just a term for a cuddly toy that you used to take to bed with you when you were a child. So that’s one of the reasons for bringing the hippo. Keith: I think the cuddly toy term hadn’t been invented. Everything was just called a bear. Ann: [looking at hippo] Like a sock. I think it’s wool. Where you end up a sock. Ann: I like the tail. We liked the hippos didn’t we? 15.20 – Raymond: You know you were talking about black dolls? My daughter, she had a black doll. Boyko. Do you remember when the twins were born? The dark twins. There was a lot of advertising. On radio and everything. They were twins. There was Boko, and I’ve forgotten the other one’s name. But she had Boko, this doll, and she worshipped that doll. But I think she’s still got it, I think. Amazing. Wendy: I remember a black doll. It was china. And I think it was German. I’m sure it was from Germany. Either that one was, or the other one, the white one. Who I thought was so beautiful. Iona. 16.12 – Andrea: So what was Iona like? Wendy: Well, she was white. Andrea: So she was china … was she a baby or a ..(Wendy: pardon?) Were your dolls babies? Ann: They feed them now don’t they? Wendy: They feed them, they burp them. Feed them one end and it comes out the other. Raymond: I know. My daughter, Boko was always in her dolls’ pram. Pushing her up and down the road, you know. Lizzi: Did you have a teddy Ann or …? Ann: No, I was never into dolls. Ann: Although, saying that, I did have a china doll when I was very young but I never used to play with it, you know. And then they bought me a doll, a walkie talkie doll with a pram, (yes) and I wouldn’t play with that you know. And they sold it. I was never into dolls. Lizzi: Who bought them for you? 17:46 – Andrea: So what was it about dolls that you didn’t like? Andrea: What about anyone else? Did anyone else have dolls or play with dolls? Keith: Dolls just didn’t feature. Boys didn’t have dolls. That was for girls. They pushed their prams around. You wouldn’t be seen dead with a doll. Of course they were never bought for us, or given to us, or anything like that. It just never occurred really. It was all . . . We had teddy bears and things like that. But it all went on to all the other sorts of toys you could get for boys. 18:40 – Andrea: Well, I am going to pass some dolls round anyway. Let’s see what we can find. Now, depending on how you feel about dolls, you may or may not like some of these. 19.23 – Andrea: Does it make a noise? Not that one. That one’s got a hole in the back. It’s a fixing hole. It’s a dolls’ hospital if you need to put your hand in to get to the strings. Wendy: I remember the dolls’ hospital. That used to be down North Road didn’t it? Wendy: Trafalgar Street was it? Right down. Keith: In later life, the connection with dolls of course is wives who are into knitting things, and knitting clothes for dolls for other people. That’s the closest I’ve ever got. The crafty adults group here, quite a lot of them do dolls’ clothes, and dress up dolls for various reasons. Andrea: That’s because it’s china that one. That’s why it’s so cold. 20.24 – Ann: I had a china doll like that, but it was bigger. Wendy: Yes, I had a china doll. 20:40 – Clare: I had a plastic doll with jointed arms and legs and my grandmother knitted four sets of clothes similar to that. I should have kept it really. I didn’t keep it. I feel bad about that now. 21:01 – Keith: The nearest to dolls that boys came, was Action Man. And I didn’t have one but my friends did and I used to sort of play with them a bit and dress them and so on. Didn’t think of that as a doll. That’s Action Man. 21.33 – Wendy: That’s more of a baby isn’t it? Raymond: On top of my wardrobe in its box, I haven’t got it down for a long time, it’s still in a box, was a clown and I mean that was my boys and it’s still up there in the box on the top of the wardrobe. Keith: My wife’s got several of those at home, even up until fairly recently they’ve been knitting various outfits. What was it they knitted? Oh, that’s right, somebody gave them some … I think it was bears and they got the patterns in with knitted clothes and dressed them and sold them at the 50+ event. Last year I think it was. And people have asked for them because they wanted them so that we knitted the clothes for them. 22.56 – Raymond: That’s real baby that one isn’t it? Andrea: China head but fabric body that one. And that’s about the same sort of age as Gustav the bear. That’s our old one. About 1910 that doll. That’s our put in bubble wrap doll. 23:32 – Andrea: So I’m going to send Action Man round, you were just saying that you played with Action Men but you wouldn’t have called Action Man a doll. Keith: [to Clare]. Now that’s interesting. You just took him and passed him to me. But the doll you took hold of and gave it a good examination. Clare: if it had been a Sindy doll I’d have had something to say. Andrea: So Action Man not dolls then? Keith: Never thought of them as a doll. You compartmentalise these things. I wouldn’t think of a teddy as a doll. They’ve got their own definite place. Is that a Sindy doll or something? I wasn’t interested in those either. Clare: Yes. I had lots of Sindy dolls. I had stables and the horse and the house. 24:36 – Keith: Well l think the trouble is, by the time these came out, we were too old for them really anyway. Raymond. Yeah, yeah. Well my children were small. Keith: I don’t know if we’ve got a date for them? Lizzi: Mid Sixties I would say, yes, yeah. Probably about the same time as Sindy isn’t it? Yeah. Keith: I think my sort of connection with Action Man would be with the nieces and nephews, ‘cos they had them because when we visited them, I had to dress them up and undress them and put their diving gear on and various armaments and so on but I s’pose if they’d been around when I was that age I’d have probably have had them. Wendy: Ooh look at this. Seersucker that called that. Do you remember that? Seersucker. 26.40 – Raymond: It’s like we were saying earlier, our era, just before the war and during the war years, I mean it was the depression wasn’t it? I mean, your parents couldn’t afford to buy you toys (Wendy: no) and during the war you couldn’t get them (Wendy: that’s right). I mean this is the thing and as I said earlier, I mean what I had, I was an evacuee in the Yorkshire during the war, but before the war, we lived in Brighton, we had virtually nothing. You know, this was the thing. I mean, if we didn’t have things, we used to make bows and arrows, catapults (Wendy: yeah! ), you know, make our own enjoyment, didn’t we you see. This was the thing you see. 27:27 – Keith: One of the things that I’ve just thought of, my father used to make for me, ‘cos he couldn’t afford to buy one … I don’t know if you’ve got one in your box and that’s almost a doll, was a little H-section thing with a doll hung on it and you squeezed it and it (Wendy: oh yes) would do somersaults and I can remember my father making several of those. Keith: But again, it was a home-made thing, like so many of the things we had then. 28.24 – Lizzi: Did either of you have sisters that had dolls or ..? We had large families. But, oh,yeah. Wendy: 12? I could hardly cope with one. Raymond: How my mum used to cope, I don’t know. Wendy: And they didn’t have washing machines. Raymond: No, no washing machines. Wendy: And the nappies had to be washed. Raymond: Oh yes, well you had to boil them didn’t you? Wendy: Well even my son, is 53 now, but even he, there weren’t the throw away nappies in those days. 32.17- Lizzi: Did you remember your sisters having dolls or not? Raymond: No, well, being older and unfortunately I was evacuated you see. The three eldest were evacuated. You see and this is the thing, when you came back, you had a lot of brothers and sisters that you didn’t even know. And being the eldest, you didn’t take notice of those things. You know I expect the others did have dolls and what have you, (Lizzi: but you don’t remember). I don’t remember, no. Wendy: How long were you away for? Raymond: Five years and we went right at the beginning and didn’t come back until the Japanese war ended. Ann: What was that from London? Raymond: No, from Brighton. It was in the beginning they evacuated us from here, didn’t they because they thought of the invasion didn’t they from France. From the coast. So they shipped us all up to Yorkshire. Ann: They wouldn’t let me be taken away. Raymond: They wouldn’t no? (Ann: No.) No, that was the reason why. Then when they bombed London, they brought the Londoners down here, didn’t they? They never brought us back though, that was the thing. Ann: My husband was evacuated from London. He and Mabel and June were evacuated from London. Raymond: That video Mr Tom, that always reminds me of me because that boy, that lumber jacket, cord lumber jacket, that’s what I had and I was dressed like that, you know. Wendy: It must have been very traumatic. Raymond: You cried your eyes out, didn’t you, you know this was it when you were first … and then, when you came back, I mean I cried my eyes out again, even though I was nearly 14 and I remember I cried my eyes out then because I’d been brought up as a one parent child, hadn’t I? (Wendy: yeah) You see, this is the thing. You come back to a family, you know and it’s totally different, yeah. 32:07 – Ann: Do you remember those balloons, those big balloons?? Ann: Do you remember when all that silver paper came down in the streets? Keith: Oh yes, yes we used to run up the Downs collecting that, it was good for Christmas decorations. Ann: Yeah, all that silver paper, all over the pavements and everything. Keith: Silver streamers. People collected it. As kids we used to run up the Downs collecting it all. Christmas decorations, it’s quite good actually. Nice long strips of silver paper. Wendy: So what was it from? Keith: Yes, interfered with radar. Yes, they used to just fly over and drop it everywhere. It was like rain coming down. I think what they did, they threw it over and did that before a raid was coming so it messed up the radio. Ann: And they dropped the bombs didn’t they? By Bishop Hannington church. Keith: Yeah, we just went up on the Downs and collected it afterwards. Ann: It landed between a wall and a tree. It stopped the clock and everybody went to church for thanksgiving because it didn’t go off, this bomb. Away from… talking about the war days. 33:54 – Andrea: Now the other thing I’ve got, I’ve got a few construction toys. Now, it’s up to you whether you want me to do these now or whether you want a quick break and then we’ll think about construction toys. Are you happy to keep going or …? Keith: It’d be quite nice to keep going. Incidentally, when you’ve finished, and you’ve got them all up there, I’d like to take a picture. Clare: I was going to say the same thing. Capture it. Andrea: We didn’t bring everything though. Andrea: We happen to have a camera as well. We’ve brought along a range so actually, before I pass them round, what do people remember themselves about construction toys? Wendy: Meccano [several people repeat Meccano]. Raymond: And you’d have all those little screws Wendy: And nuts. Wendy: You’d have a little screwdriver wouldn’t you? Raymond: Yes, yes, that’s right. Raymond: I was just going to say – we always used to make a crane. Andrea: And yes it works. You can turn the handle. It should work. Ann: I used to like making those ones. 38.35 – Andrea: We’ll come to that in a minute. 39:39 – Andrea: Really upmarket if you got which one? Keith: One of the motors, the Meccano motors. Raymond: Oh yeah, yeah, yeah. Lizzi: When you say expensive, do you remember how much roughly they were? Keith: Probably two and sixpence or something like that. I expect a very rough guess at five or ten shillings or something like that. Andrea: Which was a lot, wasn’t it? Lizzi: To put it into context, how much pocket money did you get at that point? Keith: Probably about ten pence a week or something. Old pence. I can remember that some of the Dinky toys were one and sixpence each. That was … you had to save up for that. Keith: That was the other thing we had a lot as kids, was Dinky toys. [Overlapping speech]. Keith: It was unfortunate in some ways. She was very good at recycling and as soon as I finished with something, it got given to somebody else. All of my Dinky toys were gone like that. 41.17 – Andrea: So did you all have Meccano? Wendy: I did, yeah. [Overlapping speech]. Keith: Sometimes a few tin soldiers. 41.51 – Andrea: So you were saying over here that you did have Meccano. Was it normal for girls to have Meccano? Wendy: I think mine was my cousins actually and I think it was handed down. My cousin, being a male and I think that’s where it came from. His Meccano because I had his train set as well. You know, Hornbys. Wendy: They used to fall off didn’t they? Fall off the rails. Keith: You had a tight circle with one of these wind up trains. You could get it going really fast. But if the joints came apart. Ann: They have them laid out on a big table now, don’t they? Raymond: Well you were really something if you had one, weren’t you, oh dear me. Ann: I only remember getting Meccano for John and Gary, and then I used to build it then. Keith: I never had the electric trains. That was always far too expensive. But the wind up ones . . .
43.44 – Andrea: So when people made things out of Meccano, did you used to follow instructions? (Wendy: yeah) And do what they told you to do? Keith: The thing is, they all came with instructions (Ann: Yeah, it was just like that ) difficult to remember, but I don’t think we did much with developing our own ideas, I think we did more we made a specific item, where the instructions came in a box. Raymond: Well you did use to make your own bits and pieces up, you know. Keith: Well, very much in those days, you had to follow the rules. And if you didn’t follow the rules. It was very much you’ve got to do it this way, you must do it that way, ‘cos that’s what it says in the book. 44:50 – Andrea: Another couple of bits I’ve brought along, I suppose actually to take you backwards. Have some building bricks. Keith: That immediately reminded me of plasticine, because that’s the other thing we used to do. Lynne: Where’s the golliwog? You haven’t got a golliwog then. It was my favourite toy when I was younger. And then some very bigoted people suddenly thought you can’t say that. So all the normal people who thought it was a lovely toy – it was taken out of circulation. Andrea: That’s okay. We’ve had a look at teddy bears and we’ve had a look at dolls. And feel free in a minute to look yourself. But we’re just thinking about construction toys. We’ve been talking about Meccano and we’re just having a look at bricks. 47:19 – Andrea: did anyone have bricks? Keith: Yes. Not that sort. Andrea: So what sort of bricks did you have? Keith: Um, I can’t remember what they were made of but they were little sort of brick shaped bricks. The same proportion as bricks and you just laid them down and did brick things until they fell down of course. 48:50 Andrea: I was about to say, if anyone wants to break for a cup of tea in a minute. If anyone wants to have a go, then I will definitely be leaving this on the table. Does anyone remember Bayko? Andrea: Hm, I thought it might be. Clare: So this is pre-Lego? Andrea: It’s pre-Lego. Bayko is like 1930’s onwards. (general indistinct chatter) And little metal rods. If you look in that cream box. Raymond: You start with the base don’t you, and then you build up from the base. Wendy: I thought it was more a boy’s thing. Andrea: What Bayko? More a boys’ thing? Raymond: I played with it. But I think I played with it with my children when they were very small. You worked with them and you built It up it with them, that’s that’s what you were doing, wasn’t it? Ann: You don’t? No I don’t either. Lynne: What year was that? Andrea: Bayko? Thirties, forties mainly. Keith: Cause I think the ones that I had were probably the early models of that I don’t remember the metal bits. That was probably a later development of it. But I definitely remember building houses out of that. Raymond: That must have been in the fifties. Andrea: Yeah, I was interviewing someone the other day who I think was born in 1947 and she played with Bayko a lot when she was young. So … And as you say, if you’re thinking about forties, then toys weren’t being manufactured during the war so you wouldn’t have had it being produced then. So I think it might have been produced a little bit before but then obviously war halted toy production. 52.00 – Keith: Probably by the time I got to 12, 13 and then of course it’s things like I went into the ATC, the Air Cadets and so on who did real things then. Clare: That’s a hundred years old Lynne, that teddy bear. .
Andrea: Oh yes, that’s Gustav. Lynne: Has it been repaired? Andrea: Not that I’m aware of. Lynne: It doesn’t look like it. That makes it in amazing condition. 52:40 – Andrea: I’ve only owned him for a few weeks. I don’t know his whole history. Lynne: Is that after or before the Steiff bears? Lizzi: I’m not a Steiff expert but I do know that Steiff’s been going for roughly 100 years. Andrea: Yeah, it’s about 1900, 1910 so he’s 1920’s. So yes, same sort of period. I’m going to hand round a … someone did just mention Lego, so have a pot of Lego. I know Lego wasn’t around for a lot of you. 53.35 – Andrea: Yes indeed. Well what we’ll do in a minute is we’ll go and make some more tea or something and then people can actually play with some of the things they want. I think especially with some of the construction ones, you don’t necessarily just want to be passing them round. 54:18 – Keith: another one I see you’ve got ready on the floor there is Airfix models, They were after my time, I mean I was sort of a young adult by the time they came in. But from probably 12-13, I was making model aircraft out of balsa wood. However, we used to go to the shop that sold this, I can’t remember what they were called, in the Lanes. You went in the first entrance to the Lanes in North Street. And just along there, there was a large shop that was all model aircrafts. And you could either buy them as kits or you bought the plans and the balsa wood and make up yourself, and the paper one. Keith: I can’t remember for the life of me what the name of the shop was, but it was the big aeroplane shop. Andrea: And which did you used to do? Did you used to buy the kits or did you buy the separate …? Keith: I did both. Sometimes I bought a plan but mostly, I’d buy a kit and everything you wanted was in the kit. Then when you broke something, you had to go and buy some balsa wood to repair it and so on. But I lived in Patcham because we were only a very short walk from the Downs which is now sort of a building site, all sorts goes on up there now. But that was all open land and we’d go up there to fly them. The other place we’d go to fly was up near the Chattri, on the road up to the Chattri, we used to get, we’d go there to fly model airplanes that we’d made up, we sort of flew them straight down … You’d see all the big boys and the men with their model aircraft, they’d go soaring away, radio controlled and all the rest of it. That was the sort of thing we played with when we were teenagers. Keith: Oh, they varied. Some were little ones, and the little ones were always much too heavy. They were the right shape but they didn’t fly but you did get some quite big ones. I remember one, I’ll never forget it, it was called Sentinel which was an odd thing, and it had one wheel on a stalk and the wings went along and went upwards and that thing really flew. And it had a sort of rubber band propeller and you sort of threw this thing and it went up and it glided down and you hoped it landed somewhere where you could go and get it but as I say, a lot of the boys where I lived were really into that. Wendy: Did we not used to go and buy the weights, the lead weights to put on them? Andrea: Put on their noses? 57.44 – Andrea: Now I know we said we could have a play while drinking tea, this one isn’t going to be made while drinking tea I don’t think. [Overlapping speech re Airfix models being looked at. Lynne mentions jigsaw puzzles]. Andrea: Are they construction toys? You tell us. Raymond: A Spitfire, yes. I remember the Spitfire in balsa wood days. The Spitfire and the Hurricane. Andrea: Interesting, when I was buying this, I asked around. I asked the project volunteers “if I’m buying Airfix, what should I buy?” And one of them went: ”you’ve got to buy a Spitfire.” You think of Airfix models, you think of planes, you think of Spitfires. Lynne: Can I ask you something a bit random? Andrea: Oh do, please. I like random. 59.14 – Lynne: I can remember, I say we, cause I’m a twin and we were always playing together, when we were younger, if we had a doll or we had dolls that we loved, if anything was wrong with them or a bit broke or something, you didn’t just get another one, like you do now you know and dispense with it. I lived in Worthing and there’s a place called the dolls’ hospital and you went off to get it mended and you went off to pick it up when it was mended and it was good to go. Andrea: So there was a dolls’ hospital in Worthing? Keith: I don’t think anything got thrown away, unless it was totally destroyed. Everything was repairable. Andrea: Did anyone destroy their toys? You just said things would get … Wendy: No, I don’t think anybody did. Keith: Nothing was destroyed. You didn’t even throw it away when you’d finished with it. You’d pass it on to someone else. And they’d be very happy to have it too. I mean nowadays everything’s got to be brand new. 1:01.01 – Keith: I think a lot of us have learnt how to repair these things ourselves. Andrea: So who else remembers the … any dolls’ hospital? Keith: I remember the name the doll’s hospital. I don’t think I ever used it. Wendy: I remember one down at Trafalgar Street. I remember there was one there and they used to have all these dolls in the window. Dolls sort of more like that little one and some didn’t have an eye. I used to hate it. I used to hate dolls without eyes. I don’t know why but it did. I can remember my cousin, who lived at Patcham, near the roundabout where the garage is now, they had a teashop there and at the top of the stairs, there was quite a large doll sat there and it had one eye. I can’t remember if it had one eye or no eyes but it was terrifying. I used to hate it. Raymond: But Lesters down George Street. Do you remember Lesters? We used to have a dolls hospital in there. And I used to be out the back there, repairing and everything like that. When I was, well, when I first started work, you know. 1:03:00 – Raymond: It was the furniture shop at the top, wasn’t it? They’d bring their doll’s prams, you could get furniture and beds and everything. (Wendy: Yes I remember that). But it brings it all back to me then. You know, when you’re talking about the doll’s hospital and all that. I remember the dolls used to come in you know with a broken leg or broken arm, even a head you know. A workshop out in the back in the yard there and you’d be out there with the old bands, the elastic, you know mending them all. 1:03:45 – Clare: Did anyone have a dolls’ house? Wendy: I did. My father put a little electric light in there and he bought that at somewhere like the dolls’ hospital. It was a little light with a switch and it’s Bakelite and you’d switch it on and off and then it had wires that went to a battery to make the light come on. Yeah. 1.04.25 – Keith: Yes, that reminds me, I didn’t have dolls’ houses but I had castles. (Raymond: Oh yes). Castles and forts. I don’t know where my father got it from, but he came home once with what to me then was a huge boat, it was a cargo boat and you’d lift the bits off where the coal, and I used to play with it in the garden and I didn’t have any water to put it on but things like that were our toys. I’ve got a feeling that … I think it’s still there … there used to be a market in Upper Gardner Street, my father used to go down there sometimes and come back with all sorts of wondrous things that he’d bought off the stalls and I’ve got a feeling this boat came from Upper Gardner Street. Wendy: Yes, I think it is still there, if it’s Upper Gardner Street. Keith: It used to be a thing, every Saturday, you’d go down to Upper Gardener Street, see what you could buy. Raymond: You talking about castles, I had a castle. It was about that big but I made that myself. All the turrets, and the ramps going up to it. I made that myself. Lynne: Out of what? Raymond: Wood, yes, yes. Wendy: Where is it now? Raymond. I expect my son, when he was small, I expect he wrecked it. Brings all the memories back doesn’t it? You think you’ve got nothing to say don’t you … it’s amazing isn’t it? Comments: There are some sections where there are overlapping voices chatting while toys are being passed around. Andrea: So, shall we start with you? Raymond: And I’m Raymond and I was born in Brighton in 1932. Wendy: No, I was much, much older. I was probably 16,17 before I was told. Maybe even older than that, I don’t know. Wendy: But I did love that squirrel. I used to pull it around on a bit of string ‘cos in the war, or just after the war, things I mean you might know but you wouldn’t, toys were very hard to come by and I had an aunty that had a doll sent to me from Germany and it was black. [laughter] A black doll, yes and that was china. Iona, I called her and I don’t know what happened to that either, unfortunately. And golliwog of course. I think most children had but I don’t think they’re allowed now, are they? 04.36 – Keith: Oh Yes, I had a Rupert teddy. He used to change colour over the years ‘cos my mother used to knit him a fresh coat or fresh skin. And I remember particularly as being quite a dark brown and then I had another one to go with him. I had no idea where they came from of course and that one was just warm, teddy colour and that one was little Ted and I had Big Ted and Little Ted. 06:24 – Andrea: Anyone else about bears? 07.59 – Clare: Well I had a big bear as well and yeah, my auntie and uncle gave my parents a big bear before I was born, so there’s the whole joke that he’s older than me ‘cos he was sitting waiting in my cot, when I was born. And it was one of those old fashioned, not those soft kind of bears, with the proper jointed arms and legs, where there’s cotton strung through so they actually move so it’s kind of with stitching up the back and the front and then it had something inside so if you tipped it over it would make a grrrah growling sound and there’s loads of photos of me, cause I was quite small when I was born, so I was probably like that big, with this big bear that was about twice the size. And I’ve still got big bear, it’s a bit dusty now. 08:54 – Andrea: Did you play with him? 10.53 – Andrea: Yeah, that one there in the pyjamas is called Gustav. Yes, he’s about 100 years old, Gustav. 15.21 – Raymond: You know you were talking about black dolls? My daughter, she had a black doll. Boyko. Do you remember when the twins were born? The dark twins. There was a lot of advertising. On radio and everything. They were twins. There was Boko, and I’ve forgotten the other one’s name. But she had Boko, this doll, and she worshipped that doll. But I think she’s still got it, I think. Amazing. 16.13 – Andrea: So what was Iona like? 18:43 – Andrea: Well, I am going to pass some dolls round anyway. Let’s see what we can find. Now, depending on how you feel about dolls, you may or may not like some of these. [General unclear talk as people look at the dolls. There is discussion about one of the dolls with a hole in the back and more general discussion]. 19.34 – Wendy: I remember the dolls’ hospital. That used to be down North Road didn’t it? Ann: I had a china doll like that, but it was bigger. Wendy: That’s more of a baby isn’t it? Clare: Yes. I had lots of Sindy dolls. I had stables and the horse and the house. 24.36 – Keith: Well l think the trouble is, by the time these came out, we were too old for them really anyway. Raymond: Yeah, yeah. Well my children were small. 26:40 – Raymond: It’s like we were saying earlier, our era, just before the war and during the war years, I mean it was the depression wasn’t it? I mean, your parents couldn’t afford to buy you toys (Wendy: no) and during the war you couldn’t get them (Wendy: that’s right). I mean this is the thing and as I said earlier, I mean what I had, I was an evacuee in the Yorkshire during the war, but before the war, we lived in Brighton, we had virtually nothing. You know, this was the thing. I mean, if we didn’t have things, we used to make bows and arrows, catapults (Wendy: yeah! ), you know, make our own enjoyment, didn’t we you see. This was the thing you see. 31:27 – Keith: One of the things that I’ve just thought of, my father used to make for me, ‘cos he couldn’t afford to buy one … I don’t know if you’ve got one in your box and that’s almost a doll, was a little H-section thing with a doll hung on it and you squeezed it and it (Wendy: oh yes) would do somersaults and I can remember my father making several of those. Raymond: I had six sisters (oh, right) and six brothers and I’m the eldest [laughing] We had large families. But, oh,yeah. 29:52 – Lizzi: Did you remember your sisters having dolls or not? 30:39 – Raymond: No, from Brighton. It was in the beginning they evacuated us from here, didn’t they because they thought of the invasion didn’t they from France. From the coast. So they shipped us all up to Yorkshire. 31:12 – Ann: My husband was evacuated from London. He and Mabel and June were evacuated from London. 32:13 – Ann: Do you remember those balloons, those big balloons?? Wendy: And they dropped the bombs didn’t they? By Bishop Hannington church. Wendy: It landed between a wall and a tree. It stopped the clock and everybody went to church for thanksgiving because it didn’t go off, this bomb. [Overlapping speech about dolls they’re looking at]. Wendy: We’re getting away from… talking about the war days. 33:58 – Andrea: Now the other thing I’ve got, I’ve got a few construction toys. Now, it’s up to you whether you want me to do these now or whether you want a quick break and then we’ll think about construction toys. Are you happy to keep going or …? Clare: I was going to say the same thing. Capture it. Andrea: We didn’t bring everything though. Wendy: Meccano (several people repeat Meccano). Andrea: And yes it works. You can turn the handle. It should work. Ann: I used to like making those ones. 36:08 – Andrea: That’s a newer one. We have got some green and red Meccano and I nearly brought it with me but it’s all in bits so we thought we’d bring an actual model. So that’s slightly more modern, that one. 37:05 – Keith: I expect that’s probably why some older folks can cope with things Ikea sells. They used to come with books of instructions about how to assemble these things. 38:03 – Andrea: Which one’s that? Ann: There was a shop down Sackville Road, under the bridge. Wendy: Is that gone from West Street? Wendy: we didn’t have elastic. 39:39 – Andrea: Really upmarket if you got which one? Keith: One of the motors, the Meccano motors. Keith: That was the other thing we had a lot as kids, was Dinky toys. 40:58 – Keith: It was unfortunate in some ways. She was very good at recycling and as soon as I finished with something, it got given to somebody else. All of my Dinky toys were gone like that. Andrea: So did you all have Meccano? Andrea: So you were saying over here that you did have Meccano. Was it normal for girls to have Meccano? 41:57 – Wendy: I think mine was my cousins actually and I think it was handed down. My cousin, being a male and I think that’s where it came from. His Meccano because I had his train set as well. You know, Hornbys. 43:46 – Andrea: So when people made things out of Meccano, did you used to follow instructions? (Wendy: yeah) And do what they told you to do? 44:02 – Keith: The thing is, they all came with instructions (Ann: Yeah, it was just like that ) difficult to remember, but I don’t think we did much with developing our own ideas, I think we did more we made a specific item, where the instructions came in a box. [Overlapping speech. There is talk about a game called five stones. And jacks. General noise and indistinct chatter as people look at toys. Lynne arrives – mentions a golliwog and says it was her favourite toy when was a child. Andrea fills her in on what she’s missed]. 48:55 Andrea: I was about to say, if anyone wants to break for a cup of tea in a minute. If anyone wants to have a go, then I will definitely be leaving this on the table. Does anyone remember Bayko? 50:36 – Raymond: I played with it. But I think I played with it with my children when they were very small. You worked with them and you built It up it with them, that’s that’s what you were doing, wasn’t it? Keith: Probably by the time I got to 12, 13 and then of course it’s things like I went into the ATC, the Air Cadets and so on who did real things then. 53.41 – Andrea: Yes indeed. Well what we’ll do in a minute is we’ll go and make some more tea or something and then people can actually play with some of the things they want. I think especially with some of the construction ones, you don’t necessarily just want to be passing them round. 56.00 – Andrea: So the planes that you made … how large were they? Are we talking ..
57.00 – Andrea: Put on their noses? 57.39 – Andrea: Now I know we said we could have a play while drinking tea, this one isn’t going to be made while drinking tea I don’t think. Lynne: Yes, ‘cos you’re building a picture of something. Definitely. 58:48 – Andrea: Interesting, when I was buying this, I asked around. I asked the project volunteers “if I’m buying Airfix, what should I buy?” And one of them went: you’ve got to buy a Spitfire.” You think of Airfix models, you think of planes, you think of Spitfires. 59.14 – Lynne: I can remember, I won’t say we, cause I’m a twin and we were always playing together, when we were younger, if we had a doll or we had dolls that we loved, if anything was wrong with them or a bit broke or something, you didn’t just get another one, like you do now you know and dispense with it. I lived in Worthing and there’s a place called the dolls’ hospital and you went off to get it mended and you went off to pick it up when it was mended and it was good to go. Wendy: No, I don’t think anybody did. 1:01 – Keith: I think a lot of us have learnt how to repair these things ourselves. 1:02:00 – Raymond: It was the furniture shop at the top, wasn’t it? They’d bring their doll’s prams, you could get furniture and beds and everything. (Wendy: Yes I remember that). But it brings it all back to me then. You know, when you’re talking about the doll’s hospital and all that. I remember the dolls used to come in you know with a broken leg or broken arm, even a head you know. A workshop out in the back in the yard there and you’d be out there with the old bands, the elastic, you know mending them all. 1:02:45 – Clare: Did anyone have a dolls’ house? Wendy: Yes, I think it is still there, if it’s Upper Gardner Street. Keith: It’s probably more posh now. Lynne: Out of what? Raymond: Wood, yes, yes. Lynne: Hammer and nails? 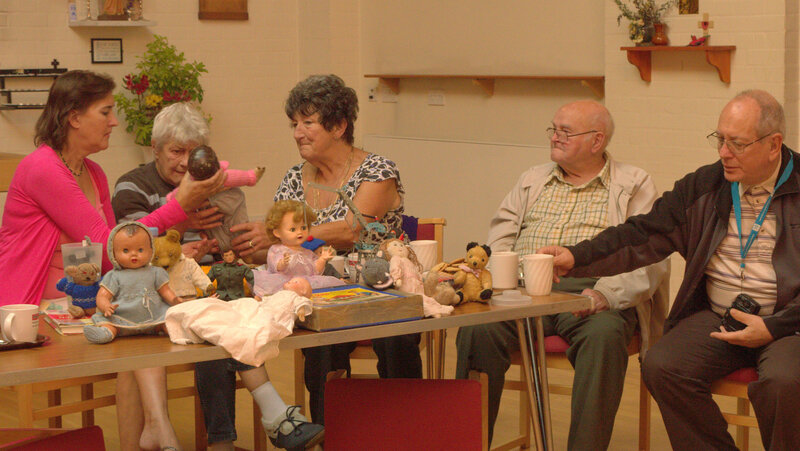 Members of the Hangleton 50+ group discussing their memories of teddy bears, dolls and construction toys. The short version (05m 32s) of the video is focused on Meccano, while the full version (1hr 06 m 41s) covers a range of toys, as well as other memories of childhood, including the experiences of members of the group during the Second World War.